Vegetables should be a vital part of your daily diet. Ideally these are chosen from what is grown organically in your local area. Serve vegetables with grains for complete nourishment. In general grains build and vegetables cleanse the body of toxins and purify and renew the blood. The combination is healing and soothing. 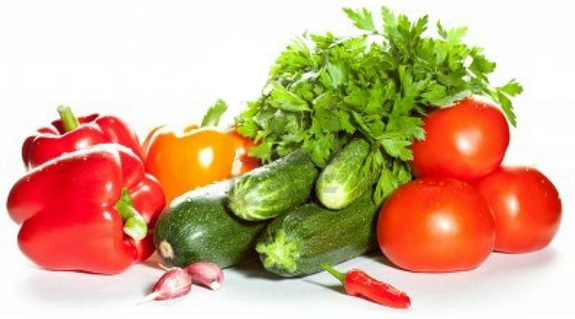 Raw vegetables in their natural state are invaluable for their nutrition. Properly cooked over 90% of their nutrients can be preserved. It’s important to avoid overcooking and excessive boiling. Keep vegetables covered while cooking. Leave them unpeeled and wash in cold water. Scrub root vegetables lightly because the vitamins are close to the skin. Tomatoes are loaded with vitamin A and C, and lycopene, which is the substance that makes tomatoes red. Lycopene is being researched to lower lung cancer risks. Smokers and non-smokers both seem to respond beneficially. Asparagus treats many types of kidney problems, helps to cleanse arteries of cholesterol and is useful in vascular problems such as hypertension and arteriosclerosis. However, too much asparagus may irritate your kidneys. Sprouts are vegetables at the greatest point of vitality. During sprouting vitamins and enzyme content increases dramatically at the same time starch is converted into simple sugars, protein is turned into amino acids and peptones, and crude fat is broken down into free fatty acids. Many of us enjoy raw sprouts on a sandwich but try them lightly steamed or sautéed. To make fresh sprouts, use one part seed to at least three parts water. Soak the seeds in a wide mouthed jar, half gallon or larger, for one quart of ready sprouts.Cover the jar with a sprouting screen or cheesecloth and secure with a rubber band. After soaking, drain well and keep in a warm (65 degree) dark place or cover with a cloth or bag. Rinse two times per day (four times for soybeans) and drain well. After three days place alfalfa, red clover, radish and mustard sprouts in a cool place with indirect sunlight to induce chlorophyll. To remove loose hulls, place in a large bowl of water and agitate. Gently reach under the sprouts, lift them out and drain. 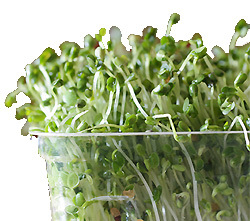 If refrigerated they will keep up to one week in a plastic bag or covered glass jar.Alfalfa is more nutritionally concentrated than other sprouts because of its rich mineralization. Roots can reach down 100 feet into the earth where it has access to minerals and trace elements untouched by other plants. Alfalfa benefits the urinary system and intestines, and detoxifies the body. It contains eight enzymes that help assimilate protein, fats and carbohydrates. Sea Vegetables (seaweeds) are classified by colors: red, brown, green, blue green and yellow green. The colors, light exposure, depth, temperature, tides and seashores in which they grow correspond to the distribution of nutrients and variety. Sea plants contain ten to twenty times the minerals of land plants and an abundance of vitamins and other elements necessary for our metabolism. They are an excellent source of food and medicine. Certain sea vegetables actually remove radioactive and toxic metal wastes from the body. In addition, they are a wealth of iodine, calcium and iron. For instance, kelp moistens dryness, softens hardened areas and masses in the body, benefits kidneys, is a diuretic, anti-coagulant, natural fungicide, and relieves hormone imbalances and more. Kelp greatly increases nutritional values of all food prepared with it as it is considered the most completely mineralized food. It is excellent added to beans since the minerals help to balance protein and oils and increase digestibility.